The Garnaut Review released its Draft Report on 4 July, 2008. Local Agenda 21 (LA21) is a program that provides a framework for implementing sustainable development at the local level. LA21 aims to build upon existing local government strategies and resources (such as Corporate plans, vegetation management plans, and transport strategies) to better integrate environmental, economic and social goals. 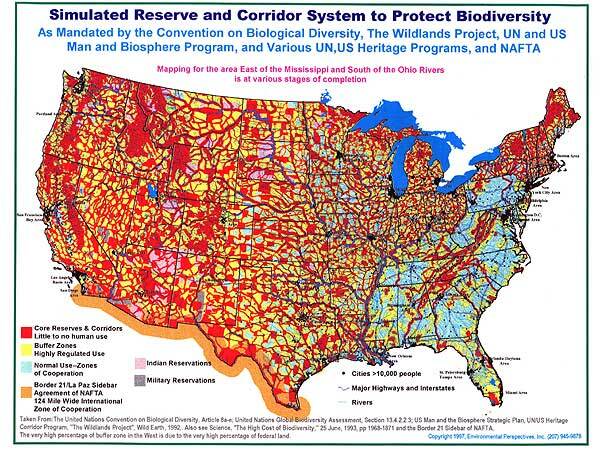 LA21 was first described in Agenda 21 - the global blueprint for sustainability that was agreed at the United Nations Conference on Environment and Development in 1992 (the Rio Earth Summit). Chapter 28 of Agenda 21 identifies local authorities as the sphere of governance closest to the people, and calls upon all local authorities to consult with their communities and develop and implement a local plan for sustainability - a 'Local Agenda 21'. In 1997 Asia Pacific Economic Cooperation (APEC) Ministers for Sustainable Development set an APEC-wide target to double the number local councils involved in LA21 by 2003. In the same year Australia's national LA21 program was established. Measuring local government commitment to LA21 and other local sustainability initiatives can be very difficult. This is due to the complexity involved in assessing how environmental, social and economic decisions contribute to sustainability. Recent survey results from Environs Australia - the Local Government Environment Network, and the International Council for Local Environment Initiatives (ICLEI) support anecdotal evidence that commitment towards LA21 in Australia has increased significantly over the past five years. Worryingly for the Government, the poll also revealed 71 per cent of Queenslanders were against an increase in petrol taxes to reduce greenhouse gas emissions. THE Rudd Government faces a massive payout of more than $1.6 billion a year to families, to offset rising energy and fuel prices under a new emissions trading system (ETS). Annual payments of about $500 million alone will be needed to protect the poor and the aged from a projected spike in electricity and gas prices. A landmark CSIRO study, to be released today, reveals the high costs of going green and comes just weeks before the Government releases a crucial discussion paper on carbon trading. The study also finds an emissions trading system to be introduced from 2010 will raise more than $8 billion in additional revenue for Canberra. This will give the Government plenty of financial scope to deliver tax cuts and other payments to soften the blow of rising weekly bills. The CSIRO report, commissioned for the Climate Institute, found average families will face price rises of up to $10 a week for electricity, gas and petrol. If the Government wants to compensate families on average incomes, it will have to pay out up to $336 million by 2015, rising to $557 million by 2020. But, with struggling families battling to contain rising petrol prices, the Government will be under pressure to extend payments to most families. This could see the Government paying out $1.7 billion in compensation by 2015, rising to $1.9 billion by 2025. The CSIRO report argues that "deep cuts in greenhouse emissions" are possible in Australia without reducing living standards. "Well-designed policy measures can protect low and middle-income households from potential short-run declines in energy affordability," it states. The carbon trading scheme will start within two years as the centrepiece of Kevin Rudd's commitment to curb damaging greenhouse gases. Under the "cap and trade" scheme, heavy polluters will have to buy permits - increasing the incentive on business to embrace low-emission technologies. Higher energy costs are inevitable, with low-income families particularly vulnerable. The CSIRO report says a yearly payment of $185 by 2015 "would fully insulate low-income households from the impact of very high carbon prices on household energy consumption". "For low income families, concerns about the increased costs of energy and other goods and services are real," said Climate Institute policy director Erwin Jackson, adding they could be overcome with "a fair and effective distribution of the multi-billion dollar bonus to government coffers provided by the ETS". Sorry Matt but we have seen it all before. I wouldnâ€™t worry about the global warming conspiracy though mate. The other big conspiracy about oil being a finite reserve that is in decline will no doubt have you hot under the collar fairly soon. Go and buy a big V8 and live like there is no tomorrow. Have fun, enjoy yourself. In fact take your money and invest in seaside real estate and leave it for your grandchildren. Attack you? Why? I do not try to debate the human genome with a creationist as their beliefs are entirely up to them even if they transgress scientific evidence. Neither would I be interested in debating real climate science with you. FEARS that petrol and electricity prices will soar when a carbon tax is introduced are unfounded, according to a new report. In 2010 Australia will enter the bold new world of an emissions trading scheme (ETS), which will put a price on greenhouse gas emissions to tackle climate change. There are concerns the scheme will leave people struggling to pay their bills. But the report by CSIRO and the Australian National University has found people will hardly notice the price rises - because incomes will rise much more quickly. "There's nothing to be afraid of," said report co-author Steve Hatfield-Dodds, senior policy economist with the CSIRO. "In the long-run perspective we can be reasonably relaxed about it." Professor Hatfield-Dodds said the ETS would increase energy prices relatively slowly, over a long period of time. Incomes would rise more quickly, as they have been doing for some time, outstripping energy price rises. So, "almost despite" the ETS, households will spend less of their income on energy. The report commissioned by the Climate Institute lobby group modelled the impact of the carbon price. Electricity prices would rise by 18 per cent by 2025 if a low carbon price was set, and by 67 per cent if a high price was set. The scheme would add 8 per cent to petrol prices by 2025 at the lower level, and 36 per cent at the highest. While the report found incomes would generally outstrip that growth, it did warn low-income households could be worse off in the short term. The report recommended the government make an "affordability payment" to poorer households of $50-$185 a year to cover the gap. This could be in the form of a direct payment, increases to social security or cuts to income tax. The Federal Government is tipped to rake in billions of dollars a year from the sale of emissions permits. The report advocates spending the money on the greenhouse payments, energy efficiency measures and better public transport. Climate Change Minister Penny Wong said the government would help families cope with the ETS. "We will ensure also that there are measures to assist Australian households to adjust to the impact of a carbon price," Senator Wong told Sky News. She would not be drawn on how much households would have to pay under the ETS, saying the government would release a green paper in about a month. Coalition climate change spokesman Greg Hunt said he was concerned the ETS would have "huge implications" for consumers. He called on the government to make it clear what the impact would be on petrol and electricity prices, and said petrol could rise by 25 cents a litre in the short term. Prime Minister Kevin Rudd said the former Howard government had planned to include transport in emissions trading. "(The coalition has) now signalled quite plainly that they are committed to running a scare campaign on climate change," Mr Rudd told parliament. Australian Greens leader Bob Brown said it was a good idea to compensate people on low incomes for higher prices under the ETS, as the report recommended. He said the government needed to change its spending to help people cut their energy use, for example by redirecting funding from roads to public transport. June 20 (Bloomberg) -- Alcoa Inc., Royal Dutch Shell Plc and 97 other companies are urging world leaders to devise a plan for fighting global warming by setting greenhouse-gas targets for all nations and creating an international carbon market. A new climate-change treaty is needed with incentives to capture and store carbon dioxide and protect forests, the 99 companies said in a statement prepared by the World Economic Forum, a Geneva-based business coalition. The group presented the proposals today to Japanese Prime Minister Yasuo Fukuda, who hosts a meeting of the Group of Eight nations next month in Japan. Oil, power and metal industries are among the biggest emitters of greenhouse gases blamed for global warming. To cut their output in half by 2050, an extra $45 trillion must be invested in clean-air technologies, the Paris-based International Energy Agency said this month. The business group said it wants government guidance on how new climate policies may affect investment decisions. ``The report makes clear that businesses can't operate in a policy vacuum,'' Willie Walsh, chief executive officer of London- based British Airways Plc, Europe's third-largest airline, said in a conference call yesterday. He is one of 16 corporate leaders who developed the proposals. The group, representing 10 percent of the market value of the world's listed companies, also is led by Jeroen Van der Veer, chief executive officer of Shell, Europe's largest oil company, based in The Hague; Chairman Alain Belda of New York-based Alcoa, the world's third-biggest aluminum producer; and Chief Executive James Rogers of Charlotte, North Carolina-based Duke Energy Corp., owner of electric utilities in the Carolinas and the U.S. Midwest. Klaus Schwab, founder and executive chairman of the World Economic Forum, presented the proposals to Fukuda in Tokyo. ``This is the first time you've had an international group of business leaders set out in a great degree of depth their vision for what the new framework should look like, and put their name to it,'' Dominic Waughray, the World Economic Forum's head of environmental initiatives, said in a telephone interview. To limit the risks of global warming, a ``paradigm shift to a low-carbon economy'' is needed, the companies said in the statement prepared by the Forum and the World Business Council for Sustainable Development, also based in Geneva. The statement called for a ``green industrial revolution,'' with rich nations taking the lead in cutting greenhouse gases and developing a global market for carbon credits, or permits to pollute. World leaders aim to reach an accord by the end of 2009 to limit emissions, replacing the Kyoto Protocol, which expires in 2012. Negotiations have stalled because of disagreement over what commitments different countries should make. The U.S. says it won't agree to binding targets unless China and India also agree to limits. Those nations say it's up to the industrialized world to first control emissions. ``We need strong leadership from governments to enable the business community to take advantage of opportunities,'' British Airways' Walsh said. Under carbon trading, companies are given emission limits and enough permits to meet that cap. If they undershoot, they're able to sell those excess credits to other businesses that are unable to meet their targets. The new treaty must include an ``unambiguous'' international goal to cut emissions, the companies said, suggesting a target for 2050 to halve output of the gases, produced mainly from burning fossil fuels. All major economies should be involved, including developing countries such as China and India, which have no binding targets under Kyoto, the companies said. The proposal called for incentives to avoid cutting down forests and to develop technologies including solar energy, nuclear power, and carbon capture and storage, or CCS, an experimental technique that removes carbon dioxide from factory and power-plant exhaust and pumps it underground for storage. The executives also said licensing agreements and funds are needed to allow clean technologies to be used in poorer nations. While no companies from mainland China have endorsed the plan, Rick Samans, managing director of the forum, said invitations are there for Chinese firms to sign up. Walsh and Koch-Weser said awareness of climate change is high among Chinese business leaders. To contact the reporter on this story: Alex Morales in London at [email protected]. To reach Professor J. Scott Armstrong with questions regarding The Global Warming Challenge, email [email protected]. How about it? A Public Debate? Life depends on it as you imply. Then there seems no time to waste in contacting him. AUSTRALIA is on track to meet its Kyoto commitments on greenhouse gas emissions - but electricity and transport emissions are soaring. Government data released today showed Australia produced 585 million tonnes of greenhouse gases in 2007, six per cent more than in 1990. Under the Kyoto deal, Australia can increase its emissions by eight per cent of 1990 levels by 2012. But the data shows it's only a reduced rate of land clearing which is keeping emissions in check. Emissions from electricity, petrol, farming and industry are all increasing. If land clearing is taken out of the equation, emissions have risen 31 per cent since 1990. Electricity emissions have increased by 47 per cent since 1990. Emissions from transport - largely cars - was next in line, increasing 27 per cent. Per capita emissions are 28 tonnes per year, among the highest in the world. The data is contained in the National Greenhouse Gas Inventory 2006, which includes figures for 2007 and is partly based on estimates. Federal Climate Change Minister Penny Wong said the report showed there were challenges ahead. "We have a lot of work to do in the coming years to reduce Australia's greenhouse gas emissions," she said. Senator Wong said the reduced rate of land clearing had been a significant factor in restraining emissions, but that this option would be less useful in future calculations. She reiterated her support for an emissions trading scheme, but would not be drawn on whether petrol or agriculture would be included. Opposition climate change spokesman Greg Hunt said the data showed Australia had long been on track to meet its Kyoto commitments due to "real action under the coalition". Greens climate change spokeswoman Christine Milne was concerned by the data. "There's no good news for Australia in our greenhouse gas inventory, what we're showing is increased emissions," she said. Senator Milne said the data showed transport emissions responded to price - and coal was the main culprit behind increasing emissions. QUEENSLAND'S greenhouse gas emissions have surged by almost 10 per cent and Australia's emissions per capita remain among the world's highest. This, according to data just released, was due largely to use of coal for power generation. Federal climate change minister Senator Penny Wong today released data on Australia's emissions of gases. A report said that, if left uncontrolled, those gases are forecast to greatly exacerbate Australia's drought, bring more frequent and dangerous cyclones and kill the Great Barrier Reef. The federal Climate Change Department's latest data - which covers 2006 - showed that Queensland overtook New South Wales as the largest greenhouse gas emitter of the states and territories, producing 170.9million tonnes of carbon dioxide-equivalent gases, up 8.9 per cent from 2005. Queensland's emissions growth rate was three times the national increase of 3 per cent (to 576 million tonnes for Australia overall). Environment group WWF's climate change policy manager Kellie Caught said the energy sector was the biggest contributor to emissions in Queensland, accounting for 95 million tonnes, or almost double the 1990 figure of 50 million tonnes. "Queensland has (Australia's) highest emissions per capita due to its reliance on coal power and road transport," Ms Caught said. "The state needs to diversify its energy portfolio by shifting freight to rail and focusing on renewable energy rather than relying too heavily on the coal industry," she said. The WWF said Australia's rising emission levels was a stark reminder that federal and state governments needed to take strong and immediate action to prevent dangerous levels of warming. The WWF wants the Government to commit to a target of cutting Australia's emissions by 25 to 40 per cent by 2020 and to a 2050 target of an 80 per cent reduction from 1990 levels. It also urges a moratorium on the building of new coal-fired power stations unless the plant from the outset uses technology that aims to capture carbon dioxide and pump the emissions into deep storage underground. Governments attending the G8 summit next month in Japan are to discuss throwing their support, including funding, behind moves to build large-scale power plant equipped with the carbon capture and storage technology, in order to boost investor confidence in the technology. The Federal Government said Australia's emissions per capita had declined but remained among the highest of developed nations due, in particular, to the dominance of coal as a fuel for power generation, although natural gas has taken an increasing share. It said emissions from stationary energy - or power stations supplying industry and households - formed half of Australia's total emissions and rose 47 per cent between 1990 and 2006, with coal-related emissions accounting for 70.4 per cent of the overall rise. Power station use of gas - which produces half the greenhouse gas emissions of coal - accounted for a fifth of the rise in stationary energy emissions. Emissions from agriculture, forestry and fishing dropped 39.9 per cent, reflecting reduced forest cover clearing. Senator Wong said the data showed Australia was on track to meet the mild targets under the Kyoto Protocol international agreement on curbing greenhouse gas emissions. But, she said, it showed Australia had a "big job ahead" to reduce them further and must work to introduce an emissions-trading scheme planned for 2010, under which major polluters would be given an economic incentive to move to lower-emission energy sources. The Australian Climate Group - a collaboration between the insurance industry, scientists and environmentalists - has called on the Federal Government to stabilise greenhouse gas emissions by 2010 to keep the risk of catastrophic warming to a reasonable level. "These results highlight how we need to change the way the economy works, to move it from a high-emissions economy of the past to the low-emissions economy of the future," Senator Wong said. The emissions-trading scheme's details were still being finalised but its chief designer recommended polluters' payments be, in part, ploughed into helping low-income households handle energy bill rises. The National Generators Forum, which represents 22 power generators, estimates the country's electricity costs will rise from $78 billion to about $150 billion if it meets the Government's target of a 60 per cent cut in greenhouse emissions by 2050. A CSIRO-Australian National University report this week said fears that the emissions-trading scheme would cause petrol and power costs to skyrocket were unfounded. It forecast slow rises in energy costs that would mostly be outstripped by income growth but it recommended low-income households receive a $50-$180 annual government payment to cover any gap between rising energy costs and income growth. Prime Minister Kevin Rudd this week met with the president of Kiribati, the Pacific Island nation facing potential oblivion due to rising sea levels. Next month Mr Rudd is to attend a gathering of G8 heads of state in Japan to discuss global warming, energy and food security issues. WASHINGTON - Exactly 20 years after warning America about global warming, a top NASA scientist said the situation has gotten so bad that the world's only hope is drastic action. A new report has called for the government to spend hundreds of millions of dollars compensating low income earners, to insulate them against increased energy prices under an emissions trading scheme. The study forecasts that the response to climate change will lead to substantial rises in the cost of electricity and petrol when it's introduced in 2010. Just how much will it cost to fight climate change? A new report by the CSIRO and the Australian National University has found that an emissions trading scheme will lead to higher energy prices. "Well, there will be price increases as we get the necessary investements in the new clean energy boom that's going to be a feature of the Australian economy over this century," Erwin Jackson, from the Climate Institute said. By 2020, petrol prices could rise by as much as 20 per cent. The cost of electricity could jump by 50 per cent. But there's some good news. The study argues that for most people, real wages growth will more than offset increased energy prices. But it calls for a multi-billion dollar fund to compensate low income earners. "It might cost around 350 million dollars a year out to 2020 but at the same time the government's going to be making you know tens of billions of dollars of revenue from the emissions trading system," Mr Jackson said. The Opposition describes the report as a reality check and says the government should instead focus on reducing vehicle emissions. "It effectively says to Australia Mr Rudd is proposing a new tax on petrolâ€�, Opposition spokesman for the Environment Greg Hunt said. But it's unclear whether petrol will be included in the scheme. "The economic cost of inaction on climate change is far greater than the economic cost of action on climate change," Prime Minisiter Kevin Rudd said. The Opposition argues Labor should look much further afield if it wants to combat climate change. It has renewed its call for the government to sell uranium to India, even though Delhi hasn't signed the nuclear non-proliferation treaty. It says nuclear reactors provide emissions-free energy. Destroying India's prospects of clean energy is another example of talk big on greenhouse and then do everything to avoid actually decreasing emissions, Mr Hunt said. India's External Affairs Minister - who's visiting Canberra - says Delhi has been aware of the government's position for a long time. "Australia's commitment to non-proliferation is firm and we respect that", the Indian FM told SBS. The government says it wants to take its relationship with India to a new level. At this stage, it doesn't appear that the disagreement over uranium exports will prevent that. MOTORISTS have had their strongest hint yet to prepare for higher petrol prices under the Rudd Government's plan to fight climate change. As petrol prices nudged $1.70 ($6 / Gallon) yesterday, Transport Minister Anthony Albanese said the Government's emissions trading scheme (ETS) had to include major carbon polluters. "The transport sector, which contributes about 14 per cent of total greenhouse emissions, must be a part of any climate change strategy," Mr Albanese said. "For the ETS to be effective, we know it needs to have as broad a coverage as possible." Under a $50-a-tonne "carbon price", petrol prices would rise by about 17c a litre. Opposition Treasury spokesman Malcolm Turnbull has dropped his earlier support for the inclusion of transport fuels in the scheme. "That was the Howard government's policy," the former environment minister told Sky News. He said that nobody expected petrol prices to rise as high as they had and motorists had already had to curb their fuel use. A framework for the ETS will be unveiled next week by the Government's climate change adviser, Ross Garnaut. Figures released yesterday showed Australia's greenhouse gas emissions rose by 1.6 per cent last year, to about 585 million tonnes. Emissions were 6 per cent above 1990 levels - the year from which Kyoto protocol targets are calculated. Australia aims to cap emissions increases at 8 per cent of 1990 levels by 2012. The preliminary 2007 figures were released with the National Greenhouse Gas Inventory 2006, which showed emissions for that year at 576 million tonnes. Energy was again the biggest contributor, accounting for 400.9 million tonnes. Energy sector emissions have grown 40 per cent since 1990 and transport emissions by 27 per cent. The 2006 inventory shows a decline in emissions from 2005 to 2006 of five million tonnes, due to a reduction in land clearing. QUEENSLAND has more to lose from climate change than any other Australian state, with the twin threats of severe drought and intense cyclones, a new report shows. The state government has responded by launching a $3 million campaign to get householders to shrink their carbon footprints. Queensland Climate Change Minister Andrew McNamara today released the report from the Environmental Protection Agency's (EPA) Office of Climate Change showing the state's average temperature could rise by five degrees celsius by 2070. The report, entitled Climate Change in Queensland - What the science is telling us, said the annual temperature had risen faster than the national average since 1950. Under the current high emissions scenario, Queensland's temperature would rise by 2.8 degrees by 2050 and five degrees by 2070. The report identified the Great Barrier Reef and wet tropics rainforest as especially vulnerable. Most of the population, which lives on the coast, could face severe flooding from sea levels expected to rise by up two metres by the end of the century. "Queensland has key challenges because of our widely distributed population,'' Mr McNamara told reporters today. "We have four million people living across a much broader area than Victoria, for example. "So our transport challenge is significantly more difficult because we simply have to transport people and goods over greater distances. "We have a highly distributed economy and it's an energy intensive economy. "We have a very strong mining sector, but of course, that entails the significant production of greenhouse gases. Energy generation, which includes coal-fired power stations, makes up 40 per cent of the state's greenhouse gas emissions. The National Greenhouse Gas Inventory for 2006 showed that Queensland accounted for 170 million tonnes of greenhouse gas emissions or 29.7 per cent of the national total, ahead of the next highest greenhouse gas emitter NSW, which produced 27.8 per cent of the national total. Queensland Resources Council (QRC) chief executive Michael Roche said today the state's mining and energy companies were working to reduce their emissions. "If we want the lights to continue to come on, definitely there is a place for coal,'' Mr Roche said. Mr McNamara today initiated the program encouraging householders to reduce their carbon footprint. Based on a model developed in the United States, the "low carbon diet'' is a program that provides information and resources to help households cut their greenhouse gas emissions by two tonnes a month or up to 20 per cent within the first year. Measures include running dishwashers less frequently, using cold water to wash clothes and buying energy-efficient appliances. But environmental group WWF said the state government must do more to tackle climate change. "Queensland has the highest emissions per capita due to its reliance on coal power and road transport,'' WWF spokeswoman Kellie Caught said. Marketed under the imprimatur of the IPCC, the bladder-trembling and now infamous hockey-stick diagram that shows accelerating warming during the 20th century - a statistical construct by scientist Michael Mann and co-workers from mostly tree ring records - has been a seminal image of the climate scaremongering campaign. Thanks to the work of a Canadian statistician, Stephen McIntyre, and others, this graph is now known to be deeply flawed. The British Government urgently needs to recast the sources from which it draws its climate advice. The shrill alarmism of its public advisers, and the often eco-fundamentalist policy initiatives that bubble up from the depths of the Civil Service, have all long since been detached from science reality. Intern-ationally, the IPCC is a deeply flawed organisation, as acknowledged in a recent House of Lords report, and the Kyoto Protocol has proved a costly flop. Clearly, the wrong horses have been backed. Treasurer Wayne Swan has labelled the lack of bipartisan support as a case of an Opposition scare campaign and cheap politics. The job of trying to head off dangerous climate change is getting tougher by the day for the Federal Government. Professor Ross Garnaut hands down his emissions trading report to the Government next week. The Government has promised to outline the design of its plan by the end of the year - ready to start in 2010. But some in the Opposition want that deadline extended. "In my view yes. I don't believe that you can do a comprehensive analysis of all of the impacts of a emissions trading scheme in that time frame," Western Australian backbencher Dennis Jensen said. "I suspect that the Government will have some sort of a delaying tactic themselves," Queensland front bencher Peter Dutton added. The Coalition's pre-election promise of a 2011 introduction now appears to be up in the air but environment spokesman Greg Hunt will not specify a start-up date. "We have a very clear and unified view. We believe in emissions trading. We believe in the importance, the fundamental importance of climate change, but we do say, we will look at the timing following Garnaut," he said. The Opposition is also warning motorists the price of petrol will go up significantly if fuel is included in an emissions trading scheme. Mr Hunt says everything possible should be done to keep petrol prices as low as possible. "Is government policy for petrol prices to go up or down? Our position is very clear. We want petrol prices to go down," he said. "We think that is the right thing by the economy. That is the right thing to do by Australian families, by pensioners, by low income earners and that we can also... make real inroads into the efficiency of vehicles. "We can do the right thing by an emissions trading scheme." Treasury spokesman Malcolm Turnbull has raised the prospect of a policy change, cutting the excise on petrol to offset the effect of a carbon tax. The Coalition's positions on these two matters have angered the Government. Treasurer Wayne Swan says the lack of bipartisan support for the central plank of the Government strategy to cut greenhouse gases is another case of an Opposition scare campaign and cheap politics. "Reducing carbon emissions over time is a significant economic challenge for the nation and for the globe," he said. "We are determined to address this challenge. I think what we are seeing from the Liberals is that they are completely incapable of dealing with economic challenges and dealing with the environmental challenge of climate change." Mr Swan says Opposition's support will be needed as the Government goes through the green paper process. "We will need their support because this is a very significant economic reform which goes to the heart of our future economic prosperity," he said. "Having one side of politics involved in such a negative scare campaign, is damaging to the long-term economic interests of this country." The Treasurer has dismissed the Opposition's stance on petrol as outrageous. "We are going to publish our green paper which will discuss the design of the scheme," he said. "It will be comprehensive and when that is in the public domain, we can have an informed discussion about all of the issues in the emissions trading system. "But for Mr Hunt to engage in such outrageous lies about the potential impact of a scheme, the design of which he hasn't seen, just shows how desperate the Liberal Party has become." On climate change and everything else, the Government will have to negotiate to get its legislation through the Senate. After Parliament rises tomorrow, the Coalition loses its Senate majority. The Government's so called 'alcopops' tax hike is a case in point. The Opposition is against it. The Greens and others have big concerns. Labor will have to get the support of the Greens, and two other Senators, Nick Xenophon and Steve Fielding. Greens leader Senator Bob Brown has some simple advice for Labor. "The Government is going to have to bargain and so are we and so is everybody else in the Senate," he said. The Australian Democrats will have their last day in Federal Parliament tomorrow and Senator Natasha Stott Despoja has some parting advice too. "Well, welcome to the Senate post-July 1. Of course the Government is going to have to bargain and negotiate and compromise and do deals with the cross-bench senators," she said. "Steve Fielding has indicated what he is unsure about what he wants to do and certainly after July 1 any one senator can kill a bill or kill a government policy. "The Government will not have the Democrats and all that consistent corporate history to work with, so welcome to a very unstable place." Prime Minister Kevin Rudd has not been able to rule out a petrol price rise under the carbon emissions trading scheme. In a rowdy Question Time, the first half of which was dominated by climate change, Mr Rudd was challenged to confirm if the scheme would raise the cost of petrol. Mr Rudd used a statement from former prime minister John Howard last year, in which Mr Howard said reducing carbon emissions would result in higher petrol and energy prices, to condemn the Opposition. But Mr Rudd agreed that prices could rise. "Of course the position adopted by the former primer minister is right," he said. "If you adopt a position of acting on climate change it does have an impact on energy prices. That's just the truth. [John Howard] said it then, we say it now. The Government has also refused to confirm whether it is considering an option to push back the inclusion of fuel in the scheme until 2012. Treasury spokesman Malcolm Turnbull asked the Minister for Transport and Infrastructure, Anthony Albanese, whether Cabinet had discussed the option. In response the Minister said he would be breaking the law to discuss a Cabinet meeting. "They know the question's out of order," he said. Mr Albanese instead ridiculed environment spokesman Greg Hunt for his changed position on whether petrol should be included in the scheme. Today Mr Hunt said the Opposition was still to confirm whether it would support the inclusion of petrol. Mr Albanese claims Mr Hunt has put six different positions forward on the issue. "Six positions he's put forward on climate change. [That's] more positions than Karma Sutra," he said. "Transport produces 14 per cent of our total emissions and therefore we need to consider transport as an option." Treasurer Wayne Swan also focused on Mr Hunt. "This is a guy who has made a career criss-crossing the country in his hemp underpants pretending to be the green conscience of the Liberal Party," he said. The Federal Minister for Climate Change says a carbon trading scheme is the only economically responsible way to reduce emissions. Federal Minister Penny Wong has told Parliament the Federal Opposition is not taking the issue seriously. "Just as they squibbed it on the economic challenges when it came to the capacity constraints on the economy, so too did they squib it on climate change," she said. "They failed to do what was needed when they were in government and now they are in Opposition they are content to play short-term politics." Meanwhile a Queensland Government report released today shows the state has the highest rate of emissions per capita in the country, mainly because of coal-fired power plants. It also shows average temperatures across Queensland could increase by up to five degrees by 2070 if emissions remain high. Queensland Climate Change Minister Andrew McNamara today launched a $3 million program to encourage householders to reduce their carbon footprint. Mr McNamara says coal mining makes up 50 per cent of greenhouse gas emissions in Queensland, but other industries need to reduce their impact too. "We will be developing further techniques to enhance not just renewable energy, but the greenhouse savings which can be had right across other sectors of the economy, including the housing sector and the construction sector and the waste and resources sectors," he said. The consumer watchdog has set about educating the public on carbon offset claims. The Australian Competition and Consumer Commission (ACCC) has launched a set of guidelines in response to growing claims about how consumers can neutralise the carbon footprint of flights, cars and other aspects of daily life. "Consumer concerns about the veracity of claims on carbon offsets have led the ACCC to develop guidance for consumers and industry on the Trade Practices Act implications of carbon offset claims," ACCC chairman Graeme Samuel said. "The difficulties in understanding and verifying carbon claims give rise to concerns that consumers may be facing misleading and deceptive conduct associated with this emerging market." Kate Norris from consumer advocacy group Choice welcomed the guidelines but said the federal government should set rules for offset schemes. "There is a strong need for consumers to have access to clear information on carbon claims. The ACCC's guides will help achieve this aim," she said. "We now need the federal government to set a minimum standard for carbon offsets and carbon neutrality." The guidelines, titled Carbon Claims and the Trade Practices Act, can be viewed on the ACCC website. They are available in electronic form only "in deference to environmental concerns". The theory of anthropogenic, or man-made, global warming has become an unchallengeable fact, a piece of black letter law almost unique in the world of science. Proponents of the theory say the time for scientific debate is over. However, there is a school of thought that our knowledge of climate systems is as yet insufficient to be so conclusive on the causes of global warming. Sunday examines the political consensus building that has portrayed global warming as the most urgent crisis humankind has ever faced. This week, Ellen Fanning talks to the treasurer, Wayne Swan. This week, Ellen Fanning talks to Senator Bob Brown of the Greens about the new role of the Greens in the Senate and the impact of climate change. In many ways the great oil shock that's now causing so much commotion in world markets crept up on us. Though fuel prices have been rising, many people have been lulled by cheap Chinese imports, strong economic times and full employment. Ross Greenwood looks at what lies ahead for the oil industry. The theory of anthropogenic, or man-made, global warming has become an unchallengeable fact, a piece of black letter law almost unique in the world of science. This is propaganda that would have Orwell rolling in his grave. The theory is neither unchallengeable, nor a fact, it is a scam. Sundayâ€˜s Adam Shand finds the debate on global warming that Tim Flannery claims is over. Oddly enough, the debate Shand finds is between experts who doubt man is truly heating the world to hell and non-expert evangelists who insist he is. This is also the first time that I recall mainstream television reporting that the world has not warmed over the past decade. He has made a few statements that Iâ€™ve checked and they havenâ€™t stood the test. Is that so? Well, even by Williamsâ€™ own shonky test, he should ban himself forever for claiming the worldâ€™s seas may well rise 100 metres this century. PRESSURE over a new greenhouse gas regime and the looming Garnaut report on emissions trading is fuelling the deepest cabinet divisions over policy and politics since the election of the Rudd Government. Concerns are being aired about the possibility of the Government missing its starting deadline of 2010 for the emissions trading scheme and political backlash over rising costs and compensation for people and businesses affected by the scheme. As part of the cabinet discussions, consideration is being given to subjecting Australia's entire food production industry - including cattle, sheep, pig and grain growing - to the fulleffects of the new carbon pricing system. Cabinet and its climate change subcommittee have been sitting every day this week, sometimes almost to midnight, to decide how greenhouse gas producers, including the petrol and agriculture sectors, should be hit with a new carbon price. The cabinet has also been concerned with whether the extremely complex legislation to start an emissions trading scheme can be introduced, as promised in the election, from the middle of 2010. And as US audiences at the annual Australian American Leadership Dialogue in Washington were told that the Rudd Government could become a "oncer" because of the impact of an emissions trading scheme, cabinet is becoming more pre-occupied with the political backlash over climate change measures. The Australian reported yesterday that union leader Paul Howes and former NSW Labor premier Bob Carr told the Washington meeting that Australia should consider nuclear energy as an option to cut greenhouse gases in 10 to 20 years' time. Cabinet met again yesterday - after several meetings since last week - to discuss the ETS. Cabinet discussed whether price relief for petrol should be provided through an excise cut and when to include agriculture in the greenhouse gas reduction system. Under an ETS, industries that cannot meet greenhouse gas reduction targets will be forced to buy carbon permits, with the costs likely to be passed on to customers in the form of higher bills for services such as petrol and electricity. For every industry that is made exempt - or is given free carbon credits to continue polluting - the burden for cutting emissions is likely tofall more heavily on other industries. Parliament has been divided this week over whether petrol should be included in an ETS, with Labor and Coalition accusing each other of internal confusion over the issue. Kevin Rudd, Wayne Swan and Climate Change Minister Penny Wong have this week reiterated the Government's determination to set up the ETS in 2010 - before the next election. But as complexities of technical measurement - such as livestock emissions - and the political ramifications for industry exemptions and compensation for consumers grow, there is concern the deadline may not be achievable. Yesterday, the Prime Minister was personally confronted on talkback radio with demands to explain the ETS and to take action on petrol prices. The Opposition continued to concentrate on the impact on petrol prices of an ETS, which will set a price for carbon that will push up costs for energy-intensive industries, such as coal-fired electricity generation and aluminium, and transport if petrol is included. Mr Rudd, the Treasurer and Senator Wong all refused yesterday to give any detail on the design of the ETS and all distanced themselves from the greenhouse gas emissions report the Government has commissioned from Ross Garnaut, which will be released next Friday. Senior government ministers fear the Garnaut report will adopt far more extreme proposals on cutting greenhouse gas emissions than the Government intends to publish in its own interim "green" paper in three weeks' time, inflaming public concern about threats to jobs and higher costs. "The key question is, on the way through, how do you best support and compensate working families, working Australians, pensioners, carers, to deal with any price adjustment," the Prime Minister said. He said petrol costs were being considered, but would not say how relief would be delivered to motorists. Senator Wong said the ETS would be introduced in 2010 because it was an election commitment. But it would not be introduced "regardless of cost". Part of the Government's task was to convince people that higher prices caused by the introduction of a carbon price would mean lower costs in the long term. "Taking early and responsible action will be more cost effective in the long run for Australia," she said. The minister said Professor Garnaut was "an important contributor to government thinking" and "an esteemed economist with a strong history of reform" but he was independent. "Just as he's independent so too the Government has to make its decisions," she said. "This is hard economic reform." Some of the cabinet discussions concerned the issue of which agricultural sectors should be included in the ETS, and whether they should be put into the first or second phase of the new system. Mr Swan refused to talk about details of the cabinet discussions on the ETS, and said there would be a discussion of all issues related to an emissions-trading system. The Treasurer ruled out calls from Mr Howes, the Australian Workers Union national secretary, and Mr Carr to consider nuclear energy. Asked yesterday about the possibility of Labor embracing nuclear power, Mr Swan said: "No, a capital N-O". Opposition Leader Brendan Nelson said yesterday the Coalition continued to support a 5c cut in petrol excise. The Coalition's environment spokesman Greg Hunt said the Opposition had set out to establish a petrol price policy in relation to an ETS that meant there was "no net rise in new petrol taxes". WHEN economist Ross Garnaut chaired travel guide publishers Lonely Planet in the early 2000s, the irony of his present stint as Federal Government adviser on carbon emissions trading was not yet apparent. On Friday, as he delivers his draft report on how a carbon price will affect productivity, he is likely to make reference to the scientific findings that suggest the planet is about to get very lonely indeed if climate change is not checked before it interferes with life on earth. The Australian National University academic - credited with having engineered trade liberalisation in the 1980s, and who also chairs Lihir Gold and is a director of Ok Tedi Mining Limited - has given many signals recently that he favours a low-carbon economy guided by growing evidence from thousands of scientists reporting to the United Nations that global warming is damaging ecosystems. Professor Garnaut will have met a tight schedule when he launches his Climate Change Review findings at a National Press Club lunch in Canberra next week. He was commissioned just last year to conduct an analysis of the costs and benefits of turning carbon into a major commodity and has examined 4000 submissions and consulted widely. But whether the government also will be able to stick to its deadline of introducing a carbon emissions market in 2010 has become a key concern for major institutional investors. Pricing greenhouse gas emissions has massive implications for investors as companies compulsorily required to report their pollution levels will have to account in their balance sheets for the cost of carbon credits to offset those emissions. Conversely, industries whose operations significantly reduce the nation's carbon footprint will profit from selling earned carbon credits when trading begins. As the shake-out among the winners and losers unfolds on the way to 2010, policy makers are being bombarded by lobbyists of all hues, from green to black. Warnings to the government, such as those issued by the Business Council of Australia recently, that a hastily designed scheme would damage the economy are coming thick and fast. On the one hand the BCA has implored the government to take a leaf out of the reformist book of the Hawke era on issues such as speedy tariff cuts. That reform, ironically, was informed by Prof. Garnaut who at the time was one of former Prime Minister Bob Hawke's senior economic advisers. Yet, on the issue of emissions reform, many big businesses, such as major resources exporters like Rio Tinto, want progress slowed. In a last-minute submission to the Garnaut Review, the giant miner called for a "trial run" emissions trading scheme so that the economy could get a feel for the likely impacts before mandatory emissions targets are set. But Investor Group on Climate Change (IGCC), an organisation representing institutionals with more than $500 billion of assets under management, say bring it on. Speaking for members such as AMP Capital Investors, Goldman Sachs JB Were, Merrill Lynch, C-Bus and several other wealthy superannuation funds, IGCC executive director Joanne Saleeba said a trial run would not create certainty in the investment world. Uncertainty is death to investment, said Ms Saleeba. "We are calling for the government to stick to its timeframe for introducing emissions trading. "Institutionals are sensing there is a lot of agitation for delaying a carbon market. "I know there is considerable frenetic energy being expended on drawing up the legislation. "But along the way there are segments of the economy that say 'we need more time' to develop strategies for coping," Ms Saleeba said. The IGCC wrote to the Prime Minister earlier this month reiterating its call for "urgent and strong action by the government in tackling climate change in the face of considerable pressure to the contrary". IGCC chairman and VicSuper chief executive Bob Welsh wrote that "narrow vested interests were lobbying for delay and dilution". However, the IGCC members believed that greater costs to the economy and considerable uncertainty for business would result if a carbon market was postponed beyond the government's stated timetable. He noted that the government could draw on four years of scheme design work already conducted by the National Emissions Trading Taskforce and the former government's Task Group on Emissions Trading. "This discussion has been going on for years, there is no need to drag it on any longer, just do it in 2010," said Ms Saleeba. THE merits or otherwise of auctioning all emissions permits. WHAT level of free permits to pollute, if any, should be given to energy-intensive industries, such as aluminium smelters, which threaten to take their exporting businesses elsewhere. Climate Change Minister Penny Wong has already signalled she favours encouraging those industries to stay in Australia because of the positive influence they bring to the nation's current accounts. How much a tonne of carbon will begin trading at will be influenced by the medium-term emissions target the government sets for the nation. At the moment, Australia is on track to meet its Kyoto Protocol obligation of keeping its short-term emissions no higher than 8 per cent of what they were in 1990 - that is 552 million tonnes - in 2012. The government's long-term target is to reduce emissions by 60 per cent of 2000 levels by 2050. In December, after the government ratified the protocol, there was debate about a medium-term target for the year 2020 in the range of 25 per cent to 40 per cent of 1990 levels for industrialised countries. At the lower end of that range, the emission cuts would equal the effect of planting 210 million trees. While the paper Prof Garnaut delivers in six days' time will examine the various scenarios, it will still be a long way from revealing exactly how the government will frame its emissions scheme. AT THE end of August, Prof Garnaut will release a supplementary modelling report that will include work conducted by the Federal Treasury on the likely economic impacts of different emission reduction scenarios. Then his final report will follow later this year. According to Senator Wong, the government intends to enact legislation for the introduction of emissions trading late next year. Prof. Garnaut's delivery has been a much anticipated milestone in the climate change debate, but it is, as one observer noted, no more than the Government licking its finger and sticking it out to see which way the breeze is blowing. But if Nobel Prize winning scientists on the UN Intergovernmental Panel on Climate Change are right, legislators delaying action to slow global warming will see those breezes turn into cyclones with greater frequency, along with many other weather-related catastrophes capable of uprooting economies. BEIJING (AFP) â€” Chinese President Hu Jintao urged renewed efforts to curb global warming on Saturday, stressing "time is limited" in finding efficient solutions to the problem, state media reported. "How we cope with climate change is related to the country's economic development and people's practical benefits. It's in line with the country's basic interests," Hu said according to the official Xinhua news agency. "Our task is tough, and our time is limited. Party organisations and governments at all levels must give priority to emission reduction ... and bring the idea deep into people's hearts," the president said. Hu said more efficient energy use and increased forest coverage were among the ways in which China could make a difference. It is China's long-held position that developed countries are mostly responsible for climate change. But China's greenhouse gas output has soared in recent years as its largely coal-powered economy has expanded at double-digit pace, and it now ranks alongside the United States as the world's biggest emitter. However China has a population of more than 1.3 billion people, compared with around 300 million in the United States. TODAY is the unofficial start of the Government's July festival of climate-change policy. Professor Ross Garnaut opens the show today when he delivers the long-awaited draft report of his climate-change review to be issued publicly at the Canberra Press Club on Friday. A day earlier, economist and Reserve Bank board member Warwick McKibbin will issue a paper questioning the effectiveness of the Kyoto model of national timetables and targets. McKibbin's model for a hybrid tax and trading scheme was dispatched in a speech given by Garnaut earlier this month, so the timing is curious. Next week, climate change heads the agenda of the group of eight major economies (G8) meeting in Japan although oil prices may have something to say about that. And then we're back to Canberra for the release of the Government's climate-change green paper, over which Cabinet has been burning the midnight oil in the past few weeks. The Government promised plenty of action on climate change at last year's election and basked in the warm glow of an electorate duped into believing it was just another moral eco-challenge, like stopping the Franklin Dam or commercial whaling. It's got a lot colder since then. The green paper is now not expected to set any particular direction on the detailed design of an emissions trading scheme or the complex challenges of compensation, or managing the trade-exposed, energy-intense industries. Instead, it will just list different options. Economic modelling of different options has been delayed by the difficultly of the work involved and is not expected to be a big help. Industry is growing increasingly concerned at the inexperience of Treasury officials in understanding the unintended consequences of policies being suggested. Negotiations are making limited progress. This is a government looking for a deal breaker. Enter Ross Garnaut. His independent review process began in April as a political headline: Labor's Australian Stern Review, the report John Howard never commissioned. Since then, Garnaut has used the authority vested in him to flag contentious issues such as the need for even deeper cuts by 2050 as well as banking and borrowing of emission permits. His review has become a repository for ideas on climate-change policy from across the economy and to canvass the application of various economic theories. The real test for Garnaut was never going to be where his review process started, but where it finishes. His ultimate test, that of relevance, begins this week. Can his review suggest practical solutions to any of the major policy headaches faced by the Rudd Government as it tries to design an emissions trading scheme, or will it be politely marginalised as an "interesting" academic exercise? The biggest of these is how the scheme should treat Australia's trade-exposed, energy-intense industries such as LNG, aluminium, steel and cement. They constitute more than 40 per cent of total emissions and dominate export earnings. Both sides of politics and Garnaut accept the need to compensate these industries to the extent that they cannot pass on the cost of their greenhouse emissions to their customers. But even defining the scale of this sector is difficult. After a generation of deregulation starting with Gough Whitlam in 1972, Australia has a highly trade-exposed economy. Even miners and the dairy industry put a case for their trade-exposed status along with domestic suppliers competing directly with imports not subjected to a carbon price. Just carving these sectors makes the job of reducing emissions even harder for the rest of the economy. Including them makes them uncompetitive, cutting exports, increasing imports and driving investment offshore. It is an excruciating problem, but one well suited to a respected international trade expert such as Garnaut. He has the assistance of more than a thousand submissions from across the entire economy, containing hundreds of thousands of hours of thinking from the best informed and sharpest thinkers in this policy space, along with everyone else. Synthesising all that information in the limited time available is a substantial undertaking, but scattered throughout those submissions could be pieces of information that could help solve these problems. Consultations between Garnaut and most of those feeding into his process has been limited, leading some observers to presume that Garnaut has decided to try to work it out himself. If the impasses remain, the options left for the Government will be framed by Kevin Rudd's risk-averse political instincts, obsession with the interests of working families and dogged adherence to honouring election promises, however flawed. A trading scheme will begin some time in 2010, so long as it is after the next federal election. Whatever the final arrangements for the allocation of permits and compensation for power stations, their price will be capped low to ensure a soft start that won't derail key sectors of the economy. Petrol will be included but excises will be cut to ameliorate the political backlash. It will look like a trading scheme but operate like a carbon tax. It will frustrate activists and industry in equal measures and buy Rudd time until he can work out his next treacherous step. It's what Howard would have done, too. Professor Garnaut will be hosting public forums from 7 to 11 July 2008 in cities around Australia for discussions with the community on the Draft Report. These forums will provide an opportunity for individuals and organisations to discuss the Draft Report with Professor Garnaut and the Review Secretariat. MOST Australians are prepared to pay higher energy bills to fight global warming but support wanes when households are confronted with the extra spike in fuel prices likely to be caused by the inclusion of petrol in an emissions trading scheme. The latest Newspoll, conducted on the weekend as Labor suffered a 6.5 per cent swing against it in the Gippsland by-election, partly because of record petrol prices, shows support for the ALP and Kevin Rudd has dropped to its lowest since the election. But while Coalition support has risen during its campaign to cut petrol excise, Brendan Nelson's backing as Opposition Leader has not improved. Cabinet met every day last week as the Government designs an ETS that will impose a carbon cost on energy in an effort to reduce greenhouse gas emissions. According to the latest Newspoll, conducted exclusively for The Australian last weekend, 61per cent of Australians support an ETS and 56 per cent said they were prepared to pay "more for energy" to slow global warming. 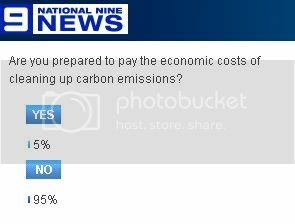 But voters were almost evenly divided -- 46 per cent to 42 per cent -- on whether petrol should be included in such an ETS, with the strongest support for inclusion being among those earning more than $100,000 ayear. The Opposition has been arguing since the budget that the 38.1c petrol excise should be cut by 5c a litre and that if petrol were to be included in an ETS, the excise be dropped completely to ensure no net rise in petrol taxes. The Newspoll showed the Coalition's primary vote jumped six points to 39 per cent and Labor's primary vote went from 46 per cent to 44 per cent. With a two-party preferred vote of 45 per cent to Labor's 55per cent, based on preference flows at the last election, the Coalition's primary vote and two-party preferred vote are the best since Dr Nelson became Opposition Leader shortly after the November election. Satisfaction with the Prime Minister dropped five points from 59 per cent to 54 per cent and dissatisfaction rose seven percentage points to 32 per cent -- Mr Rudd's worst satisfaction rating with the public since he was elected. Yesterday, Mr Rudd brushed off the swing against the Government in the Gippsland by-election in eastern Victoria, and refused to comment on opinion polls. "I think opinion polls come and go ... and by-elections will come and go. The key challenge is this, to govern for the future. And that means, from 1 July, bringing in these practical measures to assist working Australians, working families, pensioners and carers, who are under financial pressure," he said in Mackay after a community cabinet meeting. Support for Mr Rudd as preferred prime minister fell from 68 per cent to 64 per cent and Dr Nelson's support was virtually unchanged, rising from 13 per cent to 15 per cent. While the Coalition's strong showing in the federal Victorian by-election is seen as a fillip for Dr Nelson's leadership, public satisfaction with him has not lifted. Satisfaction with the Opposition Leader remained unchanged on 36 per cent and dissatisfaction rose to a new high of 42 per cent. Yesterday in Sydney, Dr Nelson said Mr Rudd claimed the swing against Labor in the Gippsland by-election was a result of the "hard decisions" the Government has had to make. "Mr Rudd has actually made very few decisions since he has been in government. He runs around the country telling people he is going to do all sorts of things. "There is no clear strategic direction, no sense of priority in the Government," he said. As the Government prepares for the release of the greenhouse gas report of Ross Garnaut later this week, the Newspoll survey showed that 61 per cent of Australians support the idea of a carbon emissions trading scheme to slow global warming, with only 25 per cent against. The strongest support for an ETS was among 18-34 year olds, with 73 per cent supporting a scheme, among Labor voters (67 per cent) and among higher income earners. A clear majority, 56 per cent, was prepared to pay higher prices for energy to help fight global warming, with 39 per cent saying they would not. People earning more than $100,000 were most strongly in favour of paying more -- 67 per cent -- followed by those earning between $70,000 and $99,000, on 64 per cent. When asked if petrol should be included in an ETS, after being reminded that the exclusion of petrol could push up other energy prices, there was a much closer result: 46 per cent in favour of the inclusion of petrol in an ETS and 42 per cent in favour of excluding petrol and avoiding higher bowser prices, even if it pushed up other energy prices. The biggest support for including petrol was among those earning more than $100,000, those aged 35 to 49, and Labor voters. Finance Minister Lindsay Tanner last night conceded that the response to climate change was "a very complex and very big problem for the Government -- but it's one we can't avoid". He said Australians had to realise that "really severe problems are going to hit, not just our country, but the entire world" if no action was taken. "We don't have a choice," he told the ABC's 7.30 Report. "We've got to be ambitious." The "only responsible course" was to tackle the problem, Mr Tanner said. "We believe that history tells us that the Australian people reward political parties and Governments that do face up to big problems, even though they'll take some skin off them on the way through." The Opposition's environment spokesman, Greg Hunt, said the Coalition's position was that there "should be no new net taxes on petrol". He said Labor appeared to be moving towards the Coalition position because there was a risk an ETS could "add a new tax to petrol of 10c, 20c or 30c a litre". Do you believe this, that voters will put up with such a tax? This is disgraceful, basing a tax on a non-existent problem. Absolutely not, initially. But an election is in 2010, when it's instituted they'll gripe and complain but they'll take it. People know that the debate isn't over and know that a carbon trading scheme would only hurt the poor as the rich are the only ones able to pay to continue polluting. It's that vocal minority of Environmentalists backed by their globalists friends that put the fear and indoctrination into people. KEVIN Rudd has called for the Opposition to end its "cheap populism" on climate change, amid Coalition claims the Labor Party is made up of utopians who want to shut all power stations. The Prime Minister, with the Government in the process of designing an emissions trading scheme, yesterday appealed for bipartisanship from the Coalition instead of a scare campaign on the cost of acting on climate change. His comments follow a fortnight of political exchanges, with the Opposition warning that putting a price on carbon will raise fuel prices by up to 30c a litre and claiming the Government could produce a half-baked scheme if it rushes to meet its target start-up date of 2010. But Mr Rudd, speaking yesterday in Mackay, north Queensland, said it was time to consider the benefits of action on climate change, not just the costs. "This is the right way to go - to have a rolling, policy-focused dialogue with industry and the community sector and make sure we do the right thing by the planet, the right thing by industry, the right thing by households," Mr Rudd said. "What I would hope for is that Her Majesty's loyal Opposition would actually regard this as a bipartisan challenge for the nation." The Coalition had opted for the "cheap populist route" and run a fear campaign, instead of contributing to a reasoned debate. "We intend to act in the long term in the right interests of the planet and the environment and to do so in a responsible manner which is mindful of the nation's economic interests and mindful of the financial needs of Australian households," said Mr Rudd, who repeated his guarantee that the scheme would begin in 2010. Earlier, Opposition environment spokesman Greg Hunt renewed his warning of big rises in fuel prices under an ETS. "People will suffer - pensioners, low-income families," Mr Hunt said. "But they simply won't produce the decrease inemissions that is necessary." The Opposition was proposing "a solar continent", he said, and claimed Labor wanted to shut power stations. "Instead we have to clean them up. There are large sections of the Labor Party that want to close down the power stations, who live in a utopian world which doesn't care about the impact on Australians, either in terms of their employment or the impact on Australians such as pensioners and low-income families who would have to deal with this nightmare." But Mr Rudd said that as a Queenslander he was a strong supporter of the coal industry and had no plans to shut mines. "That's why the Government, for the first time in the nation's history, has established a $500million national clean coal fund," he said. "Already we are participating in projects aimed at bringing on stream large-scale clean coal power generation plants ... We've got to take this new technology of clean coal from the laboratory and commercially apply it in power stations." Opposition Treasury spokesman Malcolm Turnbull, the former environment minister, said the Environment Department had told him last year it would be hard to finalise an ETS for 2011. Mr Rudd wanted to appear "macho" by nominating 2010 despite the "intense complexity" of the changes, Mr Turnbull said. "What Kevin Rudd has done has got a start date that I thinkguarantees it will go off half-cocked." The record storms and floods that swept through the U.S. Midwest last month struck at the heart of the corn-growing region, drowning fields and dashing hopes of a bumper crop. They also brought into sharp relief a new economic hazard. As the world grows more reliant on crops like corn and palm oil for its fuel supply, it is becoming vulnerable to the many hazards that can damage agriculture, ranging from droughts to plagues to storms. The U.S. floods have helped send the price of ethanol there up 21 percent since the beginning of June. They appear to have had little effect on the price of gasoline at the pump, as ethanol represents only about 6 percent of U.S. transport fuel today. But that share is expected to rise to at least 20 percent in coming decades, similar to a broad global trend toward increased use of biofuels. Experts fear that a future crop failure could take so much fuel out of the market it would send prices way up. Eventually, the cost of filling a fuel tank could depend as much on hail in Nigeria or a plant fungus in Malaysia as on oil-pipeline bombings in Nigeria. "We are holding ourselves hostage to the weather," said John Reilly, a senior lecturer at the Massachusetts Institute of Technology and an ethanol expert. "Agricultural markets are subject to wide variability and big price spikes, just like oil markets." Three years ago, the world discovered that the vicissitudes of the weather could have a powerful effect on energy prices when two hurricanes struck the Gulf Coast of the United States. Hurricanes Katrina and Rita led to the worst fuel disruption the country had ever seen, interrupting a quarter of the nation's oil production and shutting down dozens of refineries for weeks. Lines formed for the first time since the 1970s as gasoline spiked above $3 a gallon, a record at the time. The increasing dependence on crops for motor fuel adds another level of weather vulnerability. Estimates released Monday suggest that damage from the floods may not have been as bad as initially feared. But corn and ethanol prices are still up substantially from their recent lows on fears that supplies would be tight over the next year. Ethanol, which was already rising before the floods, has nearly doubled in the United States from its low of $1.50 a gallon in September. Unexpected interruptions in oil supplies have been a critical factor driving oil prices above $140 a barrel lately. On Monday, crude hit a new record of $143.67. Given the tight oil market, there is little untapped capacity that can be brought online rapidly to make up for sudden interruptions in supplies, either of oil itself or of the biofuels that increasingly help augment the oil supply. In the 1980s, that extra cushion peaked at around 20 percent of global oil consumption. Today, it represents only about 2 percent of world demand - less than Iran's petroleum exports. Analysts have warned that such record-low levels of spare capacity pose unprecedented risks to the stability of oil markets, and introduce a significant premium in the price of oil. "There is now a vulnerability to perfect storms, not just in a metaphorical sense, but increasingly in a literal sense," said Daniel Yergin, the chairman of Cambridge Energy Research Associates, a consulting firm. "In addition to geopolitical risks, you must now add weather risks." While storms, torrential rains and hurricanes have always been a part of energy production, the United States is growing increasingly vulnerable to the weather factor. The areas where most of the country's new oil and ethanol supplies are coming from - the farm belt and the Gulf of Mexico - are prone to hazardous weather. "Our energy policy is like playing Russian roulette with every chamber loaded," said Lawrence Goldstein, an energy analyst at the Energy Policy Research Foundation, a group backed by the oil industry. "We've doubled up on the weather risk." Both the U.S. government and the ethanol industry recognize the risks of tying fuels to crops. The secretaries of energy and agriculture, in a joint letter to the Senate, recently said: "If we assumed a supply disruption of ethanol, we would expect a fairly large increase in the price of gasoline until ethanol supply were re-established or new market equilibriums were achieved." Backers of biofuels contend that an increasing ethanol supply is keeping gasoline prices from rising even higher than they have, by anywhere from 35 cents to 50 cents a gallon, or 5 cents to 8 cents a liter. They also point out that the government's ethanol mandate, which requires oil companies to blend ethanol into motor fuel, can be suspended in an emergency. And they believe that future ethanol supplies will be derived from materials like switchgrass or wood chips that are resistant to bad weather. Bob Dinneen, president of the Renewable Fuels Association, the industry's main U.S. trade group, said only two ethanol refineries shut down because of the storms out of 160 nationwide. Both will reopen soon, he said. "There is a lot of overblown concern that is not really justified by the facts on the ground," Dinneen said. "Certainly the weather is going to have an impact on all sorts of industries. It had an impact when Katrina wreaked havoc on the refining industry. It has an impact on ethanol production, but it has been minimal." Andy Karsner, the assistant secretary for energy efficiency and renewable energy at the U.S. Energy Department, said that corn ethanol was a necessary precursor to more advanced biofuels. Suspending the ethanol mandate now, as some have suggested, would have a "chilling effect" on new investments, he said. In recent years, corn ethanol has been one of the few sources of supply growth in transport fuels. Indeed, biofuels have become the single biggest source of new fuels produced outside countries belonging to the Organization of Petroleum Exporting Countries in recent years. Production worldwide is expected to grow by 330,000 barrels a day this year to 1.4 million barrels a day, according to the International Energy Agency. In the United States, bipartisan public policies have driven the rise of the ethanol industry. Congress has set rising requirements for oil companies to blend ethanol with gasoline, backed with generous subsidies that should total $12 billion this year, according to estimates by Barclays Capital. The European Union is also planning to dramatically raise the amount of biofuels blended into diesel and gasoline as part of the bloc's efforts to fight climate change and bolster energy security. Farmers have gone into overdrive to meet the ethanol demand, turning more than a quarter of the U.S. corn crop to making ethanol. As a result, last year's corn crop reached a record of 13 billion bushels. Farmers who support the government's ethanol policy argue that truly disastrous weather in the corn belt does not happen often. "The last time we had real weather problems in the corn belt was 1988," said Tom Buis, the president of the National Farmers Union. "That's pretty rare." Emerson Nafziger, a professor of agronomy at the University of Illinois, said farmers still had time to recover this year, to some degree. But he said this year's storms were the first real test for the nascent ethanol industry. "We may end up feeling we dodged a bullet this year," he said. "We've had a run of fairly favorable weather in recent years. But there is no guarantee it will stay that way." IF an emissions trading scheme doesn't hurt, it won't work, economist Chris Richardson says. Mr Richardson, director of economic consultants Access Economics, said many people still did not get the concept of an emissions trading scheme and much of the pressure on politicians was wrong-headed. "The whole idea of carbon pricing is that if it doesn't hurt it won't work," he told Canberra ABC radio today. "Essentially, prices, for example for petrol as well as a whole bunch of other things, have to go up in order to encourage us to be more careful with how much we use and in order to encourage business to come up with new ways of getting it to us in ways that don't pump out greenhouse gases." The government has yet to announce just how its emissions trading scheme will work. Key adviser Professor Ross Garnaut will release his final climate change report this Friday. The government will then release a green paper setting out the issues and a range of design options ahead of white paper setting out the policy. Prime Minister Kevin Rudd says he wants the scheme in operation by 2010. Mr Richardson said this was the same basic idea as the GST as carbon (emissions) pricing would add to the price of stuff and governments would provide compensation. "Prices will go up, compensation will be needed," he said. "The fight over the bucket of money will probably end up being between consumers on the one hand, who will want some sort of tax rebates, and the businesses because a bunch of businesses are potentially quite affected. "Therefore their shareholders and some of the businesses will in effect be arguing for compensation as well." FORGET Iraq. The politics of petrol will dominate the coming presidential election in the US. As much as one hates to upset the lofty foreign policy sensibilities of the Left, you need only set foot in the US for a nanosecond to see that the campaigns of Barack Obama and John McCain are consumed by grassroots concerns over the rising cost of fuel. Just as in Australia, it is clear that the hip pocket nerve of working families may haunt the next US president, confounding efforts to address climate change. And the advocates of climate change are largely to blame. The debate in both countries has been a phony one. But the political parallels don't end there. Obama, the fresh-faced 46-year-old Democrat, is wooing voters across the continent with his promise of change. Sound familiar? He was recently described by Daniel Henninger in The Wall Street Journal as the "Hey Jude candidate, the man who can somehow make things better". Sounding more familiar? Both the Republican McCain and Obama support an emissions trading system yet remain quiet on how a cap and trade greenhouse gas emissions system will affect American working families. Boy, does that sound familiar. And, if debate in Australia these past few weeks is any indication, whether it's McCain or Obama who wins in November, they are in for one scary climate change ride. The same ride that confronts the Rudd Labor Government here in Australia. To be sure, had the Coalition been re-elected last November, it would have faced a similar problem of mismanaged voter expectations. Pushing an emissions trading system without warning people about the cost increases was always going to create a tricky political problem. But our own Hey Jude Prime Minister, Kevin Rudd, exacerbated the inevitable political backlash. By framing climate change in soaring terms as the single biggest moral issue of our time, Rudd ensured that the climate change roller-coaster was always going to crash down to earth when cost finally entered the equation. It's only in the past fortnight that Labor cabinet ministers have been admitting that the introduction of an emissions trading system will be the single biggest change to our modern lifestyle in decades. Forget opening up of the Australian economy, they say. Forget workplace deregulation. Forget the GST. This is going to be the most daunting challenge for the Prime Minister if the Government sticks to its guns over mitigating the effects of climate change. The sledgehammer realisation of the costs of the emissions trading system and other measures has kicked off a renewed call for a genuine debate over nuclear energy in Australia. While the Rudd Government has said "N.O." to nuclear power, this issue will not go away. At the Australian American Leadership Dialogue in Washington last week, climate change dominated discussion. One participant was the 26-year-old new boss of the Australian Workers Union, Paul Howes, who took over when Bill Shorten went into parliament last year. Howes says that the support for an emissions trading system is not as strong as many people think. "Once you educate the public about the costs they will have to wear, voter support will drop away. We need to be realistic about the subsidies that will be required for business. Handing out wads of cash to working families is not going to alleviate the pain of a loss of jobs. If we are going to reduce emissions and have jobs in society, we need to secure baseload power, and until the technology for that is available we need a genuine bipartisan approach to developing nuclear power in Australia." Unfortunately, as another dialogue participant, former treasurer Peter Costello, remarked, we are still locked in a frothy climate debate to the point where the Oscars in Hollywood now claim to be carbon neutral. Huh? A huge light and sound extravaganza that is beamed to 100 million TV sets, where stars fly in on their private jets, travel in stretch limousines? We all love being climate change advocates, Costello said, as long as it doesn't affect our lifestyle. Access Economics director Chris Richardson cut to the chase yesterday, telling ABC radio that "the whole idea of carbon pricing is that if it doesn't hurt it won't work". A politician serious about climate change ought to welcome higher fuel prices to change our behaviour. Drive less, use less fuel, emit lower levels of carbon gases. You haven't heard any politician say that. The political backlash would be too scary. No wonder it wasn't raised during the election last November in Australia. Exactly the same dynamics are playing out in the US for the next president. To raise these issues now, with ever-increasing fuel prices, would be political suicide. Hence McCain and Obama are ducking any real discussion of the costs consumers will wear from policies aimed at reducing greenhouse gas emissions. Instead, McCain is pushing for oil drilling off the US coast and another 43 nuclear reactors by 2030 in an effort to relieve US dependence on greenhouse gas-emitting fossil fuels. Obama plans to slap a tax on oil companies: "I'll make oil companies like Exxon pay a tax on their windfall profits and we'll use the money to help families pay for their skyrocketing energy costs and other bills." So the phony debate on climate change continues across the Pacific. Charlie Cook, editor of the highly regarded Cook Political Report, who shared his thoughts on the political contours of the looming presidential election at the dialogue, tells The Australian: "Americans have never seen energy prices this high or been more attentive and concerned about the economy. (But) the conversation about cap and trade, as far as the public is concerned, hasn't even begun. They wouldn't know cap and trade from cap and gown. All they know is that energy prices are skyrocketing and they don't like it. The debate and their thought process have not moved beyond that point. "This is complex stuff," he adds, "and complexity and campaigns do not mix. On November 4, election day, the percentage of voters who have a clue what cap and trade mean will be very small and not much bigger than today. Americans vote on themes and impressions, not on specific issues. And the truth be known, I doubt if Australian voters are very different." Cook is spot-on. But the swing against the Rudd Government at the weekend Gippsland by-election suggests that themes last only so long. Against a background of rising petrol prices, the first key test of the Rudd Government delivered a devastating blow to Labor's climate change agenda. It turns out that sometimes when you vote for a theme, you later wish you'd asked for more detail. Research suggests the Australian drought is not caused by climate change. Households are burdened by water shortages but water is diverted towards wrong agriculture. Australia is experiencing an extended period of dryness but scientists such as Barrie Hunt from CSIRO believe it is part of a natural process, and not due to greenhouse emissions. Research findings undermine a recent claim by politicians that this drought is a one-in-a-thousand year event brought about by climate change. In addition, according to The Viscount Monckton of Brenchley, mathematics proves that long-run climate predictions are not possible. This renders media hysteria imagining the drought is here to stay, to look rather ridiculous. Australia is a huge land mass that has always been prone to long periods of dryness because of its geography â€“ due to a subtropical high pressure belt. Simply put, droughts are part of a natural variability of the Australian climate and results in most of the country having low and erratic rainfall. Recent rainfall decline could even be partly attributed to mechanisms occuring in the ozone depletion layer above Australia. Each episode is accompanied by the so-called El NiÃ±o effects, which are caused by irregular warming of water currents. At this time, there is nothing unusual about the duration of the current cycle but a drought map reveals isolated pockets of lowest readings from a limited historical record. Droughts account for less than 10 per cent of all global disaster occurrences, but they account for nearly 40 per cent of all people affected by natural disasters. Prolonged droughts cause extreme water shortage and increased bushfire risk. They threaten people's livelihoods, wildlife, and also the economy due to reduced agricultural activity. * the Murray River is "dying" through upstream irrigation that removes most of its water. This practice is allowed so that Australia can export rice from the Murray region. To help ease the water burden on households, farmers should reduce growing cotton, rice, and sugar, which together account for more than one-third of the country's agricultural water usage. Instead they should concentrate on growing cereal crops, fruit and vegetables, and livestock. The Australian drought is considered by scientists to be a natural phenomenon and not caused by so-called climate change. Long periods of dryness are a historical, recurring, natural part of the Australian climate. Households currently are asked to be frugal with water but most are not aware that water is diverted to support agricultural industries that are uneconomic and pollitically sensitive, such as sugar, rice and cotton. KEVIN Rudd faces demands that he sack his chief of staff over alleged conflicts of interest caused by his lobbyist wife representing mining and energy companies whose profits are dependent onthe design of the Government's planned emissions trading scheme. But the Prime Minister has defended David Epstein and accused the Opposition of conducting "a baseless and increasingly desperate smear campaign" against his right-hand man. Opposition senator Michael Ronaldson yesterday said Mr Epstein was hopelessly conflicted and had no place working in Mr Rudd's office. Mr Epstein's wife, Sandra Eccles, heads the Canberra office of Government Relations Australia, a lobbying firm with high-powered clients in mining and energy, as well as other areas of government regulatory activity, including pharmaceuticals, communication, retailing and the car industry. Mr Epstein, a longtime Labor operative, worked for GRA with his wife before joining Mr Rudd's staff last year. The Opposition attack follows the publication of the Government's new lobbyist register, which reveals that GRA's client list features mining and energy companies that have massive interest in the Government's design of an emissions trading scheme. The scheme will put a price on carbon, with significant impact on emission-heavy industries such as coal and power generation. GRA's clients include Bluescope Steel, Onesteel, Thiess Pty Ltd, Citic Pacific Mining Management, Loy Yang Power and the Newcastle Coal Infrastructure Group, representing several major coal miners. The firm also lobbies for National Generators Forum, representing 22 power generators with combined assets of more than $40billion, as well as the Federal Chamber of Automotive Industries. Senator Ronaldson, who shadows Special Minister of State John Faulkner, said the resources and energy companies represented by GRA stood to lose or save billions of dollars depending on the design of the ETS. "If Mr Rudd doesn't cut Mr Epstein loose then every decision or policy the Rudd Government makes that affects any one of GRA's 69 clients will be mired in controversy," Senator Ronaldson said. "Does Mr Epstein take any work home with him that includes commercially sensitive or cabinet-in-confidence documents? What steps does Mr Epstein take to avoid perceived or real conflicts of interest? "What the register doesn't tell us is (whether) GRA receives a success fee if the Rudd Labor Government introduces a particular emissions trading scheme model that is favourable to some of their energy-sector clients." Mr Epstein and Ms Eccles made no comment yesterday. But Mr Rudd said through a spokesman that he and Mr Epstein had agreed upon a robust framework to manage actual or perceived conflicts of interest. The spokesman confirmed that GRA had lobbied the Government recently over climate change and emissions trading. But he said Mr Rudd had full confidence in his chief of staff. "Upon accepting the role of chief of staff to the Prime Minister, Mr Epstein resigned as an employee of GRA and disposed of his shareholdings in the company and its majority owner, Clemenger Communications Ltd," the spokesman said. THE Rudd Government has set Australia on course for a new era of greener but more expensive electricity, pressing ahead with a plan to make 20% of our power come from renewable sources within just over a decade. Honouring a key election pledge, Climate Change Minister Penny Wong has released a blueprint for mandatory renewable energy targets that is expected to be discussed at today's COAG meeting with state and territory leaders in Sydney. The move comes on the eve of Professor Ross Garnaut releasing his draft report on climate change tomorrow, which also will set a course for higher energy prices through an emissions trading scheme. Under Labor's renewable electricity proposal, existing state and territory plans would be overtaken by a single national scheme to source 20% of Australia's power from renewable sources by 2020. Reaching the target could cost an average household about $50 extra a year in power bills, on top of additional costs that would come from the emissions trading scheme to be introduced in 2010. The electricity plan defies the views of the Productivity Commission, which says a renewables target would be unnecessary once an effective emissions trading scheme is in place. Finance Minister Lindsay Tanner yesterday reaffirmed a pledge to compensate low-income families affected by higher energy prices. But the Government is set to come under increasing pressure over the prospect of even higher petrol prices resulting from efforts to halt global warming. The Business Council of Australia will today press the case for including petrol in emissions trading â€” a move that would ensure price increases. "Raising the price of energy and those goods and services that use a lot of it is what has to be done if we are going to achieve a lasting reduction in emissions," BCA president Greig Gailey will say. Under the Rudd electricity plan, renewable sources of power would include solar, wind, hydro and geothermal. Opposition Environment spokesman Greg Hunt said the plan had Coalition support but should also include natural gas and clean coal. Renewable energy companies say they are poised to unleash up to $20 billion in investment once legislation is passed next year. The Clean Energy Council's Rob Jackson urged the Government to bring forward the scheme's launch to the start of next year. The Greens also want the scheme to begin sooner. Environment groups largely welcomed the plan. But the Australian Conservation Foundation condemned the inclusion of solar hot water systems and energy generated by burning native forest wood waste. "We are concerned that would provide an incentive for further native forest logging," the foundation's Owen Pascoe told The Age. WWF lamented that the Government had left open the possibility of compensating trade-exposed companies that use large amounts of electricity. The Government plans are contained in an options paper that sets out two broadly similar approaches. Both build on the existing scheme introduced by the Howard government in 2001. They would require buyers of wholesale electricity â€” essentially electricity retailers and some large industrial users â€” to source an increasing amount of electricity from renewable energy until the 20% target is reached. Financial penalties would be imposed on companies not using enough renewable energy. The two proposals differ mainly in time scales for phasing targets in and phasing the scheme out. The scheme would end around 2030, by which time renewable energy is expected to be price-competitive with fossil fuel-sourced power. Well of course they would, exemptions are the get out of carbon trading card. KEVIN RUDD: We have taken this position of a new ambitious but responsible nonetheless renewable energy target of 20 per cent by 2020 based on modelling which has been done by MMA, a modelling firm which is in conjunction with Monash Universityâ€¦ In terms of the whole economy what the modelling from MMA demonstrates is that the total impact on the economy will be marginal over time. That is that they calculate that between now and about 2045 that youâ€™d be looking at a total impact on the economy of somewhere between $600 and $800 million or something in the vicinity of $45 per person over that period of time or something like $1 per person per year. BIG business will today pledge full support for an emissions trading scheme but it will warn Kevin Rudd against granting exemptions from the scheme for crude political reasons. The Business Council of Australia will also warn its members against overstating the negative effects of the policy at the risk of alienating the Government, and urge the community to accept that fuel and power prices are too low and must increase. BCA president Greg Gailey will use a speech in Sydney to outline his organisation's approach on climate change on the eve of the release of a report on emissions trading by the Prime Minister's hand-picked adviser on the issue, economist Ross Garnaut. According to a copy of Mr Gailey's speech, obtained by The Australian yesterday, the BCA is "wholly supportive" of the move to put a price on carbon emissions but wants the scheme to be carefully designed to ensure emissions-heavy businesses will be supported against overseas competitors from nations without emissions trading schemes. "Given the complexity of many of these issues, it seems likely that some will be put in the too-hard basket or that the simplest solutions will be sought," Mr Gailey says. "But simplicity at the expense of effectiveness increases the likelihood that we will get the policy wrong at tremendous cost to households, businesses, the economy and environment." Mr Gailey will say part of the challenge of climate change stems from the world's historic refusal to put a price on carbon truly reflective of the costs of greenhouse emissions. "Much of the world's post-World War II prosperity has been built on cheap energy or, more accurately, energy that has, withhindsight, been too cheap," he says. "A significant part of Australia's comparative advantage has of course been built on cheap energy." Mr Gailey's speech notes say oil companies predict an EIS will add 10 cents a litre to petrol prices and that raising energy prices is bound to be politically unpopular. But he says: "Raising the price of energy and those goods and services which use a lot of it is what has to be done if we are going to achieve a lasting reduction in emissions". Mr Gailey says one of the main concerns of business in the design of the EIS is managing the circumstances of trade-exposed, emissions-intensive industries. He will warn that many of the international competitors of Australian businesses in areas such as cement, paper, steel, minerals, gas and aluminium do not operate under emissions trading, exposing Australian industry to significant competitive disadvantage. "Careful analysis is needed to determine the best approach to understanding the underlying causes of competitive vulnerability in these industries and businesses and to ensuring competitiveness," he says. "Lessening the burden of adjustment on any one sector for a period of time does imply that a larger burden falls on other sectors, but that does not mean competitiveness issues can be ignored. "On the other hand, crudely carving out sectors for political reasons without robust analysis can have as much of an adverse effect as doing nothing." He will welcome recent government promises that the ETS will not boost overall government revenues but stress that some of the revenues generated will have to be used to compensate households and heavily exposed industries. Mr Gailey will adopt a tone of optimism with the assurance that the business community understands the need for change and is looking for government decisions that will provide incentives and support to deliver a shift to a low-emissions economy.